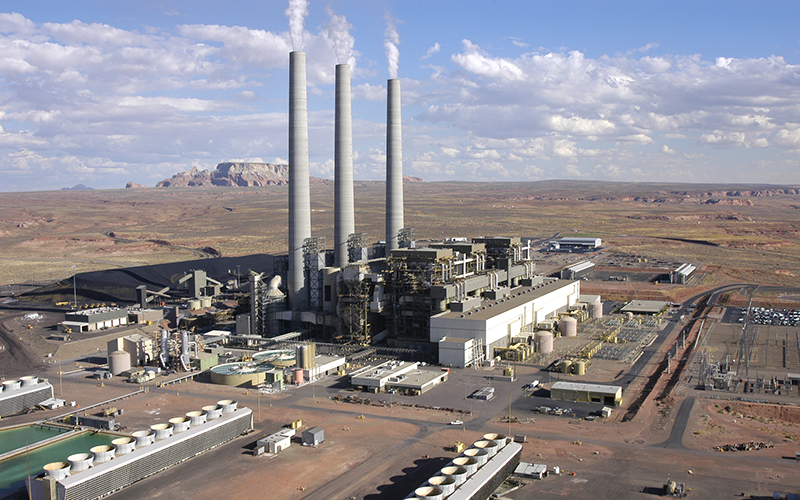 WASHINGTON – Navajo leaders expressed hope Monday that the Navajo Generating Station will be able to continue operations past 2019, after Peabody Energy said it had come up with a list of potential investors in the plant. Peabody, which mines the coal to power the plant, did not identify the prospective buyers it presented to plant owner Salt River Project, but called them “highly qualified potential investors” who expressed interest in ownership beyond 2019. SRP officials said that they will work with any potential buyers, but for now they are still planning on a 2019 decommissioning. But Navajo Nation officials welcomed the possibility that the plant could be saved, along with the thousands of jobs it and the nearby Kayenta Mine provide to that part of the state. “Navajo Generating Station, along with Peabody, provides significant employment opportunities as well as a great amount of revenue flowing to the nation,” said Mihio Manus, a Navajo Nation spokesman. SRP said the coal-fired plant is no longer cost-effective to operate, a victim of falling natural gas prices that have made coal less competitive, and announced plans earlier this year to shut the plant by 2019. SRP said it would be willing to sell the plant to another operator, but set an Oct. 1 deadline for prospective buyers to come forth. Scott Harelson, a spokesman for SRP, said that “the NGS owners will continue to work with the Navajo, and others as appropriate, with regard to potential purchasers of the plant.” But in the meantime, he said, the utility will continue to plan for a 2019 decommissioning through capital investments in contractors, and plans to decommission. Harelson said the Sunday deadline was not a hard deadline, but that the process needed to be started sooner rather than later. Names of potential buyers have not been released because of a non-disclosure agreement, said Harelson. Harelson also said that any new owners would have to negotiate a lease with the Navajo Nation, and win environmental approval from the government, which could take years. Environmental groups disagreed with the push to find a new buyer who could keep the power plant operating as a coal-burning facility, saying that the Navajo Nation should be looking to get away from coal and shift to clean energy options at the site. “There are infinite opportunities to explore and engage in to provide energy to our people,” he said. But Meghan Cox, a spokeswoman for the Navajo Nation, also noted Monday that Trump administration initiatives on coal could push prices down in the long term, making it more attractive as a fuel and undercutting arguments that the coal-fired plant needs to close. Peabody Energy, the largest private-sector coal company in the world, has been fighting to keep the plant open since SRP announced the closure in February. But CAP, like SRP, said power from the Navajo station is not cost-effective. “NGS is currently more expensive than electricity purchased on the wholesale spot market and could remain that way for many years,” CAP said in a brief filed in February. A spokesman for CAP said Monday that the company would follow through on its current commitments with the Navajo Generation Station, at which point it will look for power providers – which could include the Navajo station – through an open process.